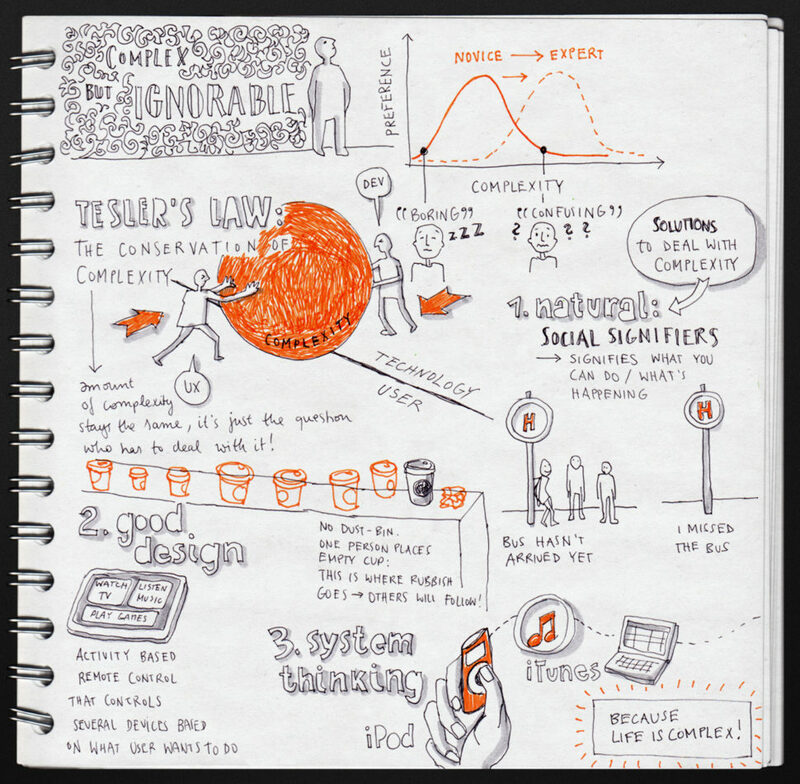 Sketchnote that summarizes Don Norman’s book “Living with complexity” designed by Eva-Lotta Lamm in 2011. Whether you are packing your bags to attend an edtech conference and looking forward to all the interesting meetings, talks and ideas the event will spark, or you are on your return journey and contemplating how to share what you learned with those back at work, consider using sketchnoting to create memorable conference summaries. Sketchnoting, sometimes also called graphic recording or visual notetaking, is a method of notetaking that incorporates hand-drawn visual elements. As Dimeo (2016) observed, sketchnoting has become an increasingly popular technique for recording information from meetings and presentations at conferences. Mendonça (2016) even uses the term ‘Doodle Revolution’. A typical sketchnote uses simple shapes, frames, and connectors to visualize information. Thus it has a low barrier and is an accessible technique regardless of the individual’s artistic talent and drawing prowess. The term sketchnoting was coined by Michael Rohde, who wanted to harness his habit of doodling to create clearer and more memorable notes by incorporating meaningful images (Rohde, 2013). Apart form conference notes, two areas of application are the facilitation of meetings and group discussions and the use as a classroom assignment. Perry & Weimar (2017) describe sketchnoting as another way to nurture visual literacy in students, and exclaim: “It seems drawing and writing by hand is making a comeback!”. As Shambaugh (1994) pointed out, many students fail to fully realize the advantages of notetaking as a process to develop a personalized learning system – the same is true for conference attendees. By creating a personal approach to visual notetaking, one is more likely to process the information, revisit, and follow up. Another reason why sketchnotes are appealing for conference attendees is that despite being typically analog artifacts, the images can easily be turned into digital pictures and shared on social media. Thus, they can help nurture the personal learning network during and after the conference. While many sketchnotes are created in real-time during an event such as a lecture, talk, or meeting, other visual notes summarize the creator’s take on asynchronous media such as video recordings, podcasts or books. Perry & Weimar (2017) see after-the-fact sketchnotes as a great way to revisit traditional notes that were taken during the conference presentation. Another way to simplify sketchnoting is to prepare beforehand, and revisits the notes afterwards to allow for further edits and additional details. Plan: Before the presentation, think over and include what you already know: the title, the description, the speaker’s background. Try to anticipate how those elements might affect the sketchnote. Focus: During the talk, make sure to get the most interesting and hardest to remember information down first. Use simple drawings to save space for them, before adding further complexity. If you need to write down a list, try adding the first word of each item, so you can finish the list when you have more time. Refine: As the presentation concludes, look over your notes: Are the main points clear? Is the flow of the talk obvious? If not, use arrows to indicate flow, texture to fix mistakes and frames to highlight key elements. Are you planning on using sketchnoting during your next AACE conference? Let us know, and use the tags #aacesketch to share your notes! Dimeo, R. (2016). Sketchnoting: an analog skill in the digital age. ACM SIGCAS Computers and Society, 46(3), 9-16. Erb, V. (2012). How to start sketchnoting. Bulletin of the American Society for Information Science and Technology, 39(1), 22-23. Mendonça, P. (2016). Graphic facilitation, sketchnoting, journalism and ‘The Doodle Revolution’: New dimensions in comics scholarship. Studies in Comics, 7(1), 127-152. Paepcke-Hjeltness, V., Johnson, J., Lefebvre, L., McCubbins, O. P., Bender, H., Wolff, M., … & Mills, J. R. (2018). Sketchnoting A Methodology: Fostering Team Based Learning Conversations. Perry, K. & Weimar, H. (2017). Sketchnoting: You and Your Students will Benefit. In P. Resta & S. Smith (Eds. ), Proceedings of Society for Information Technology & Teacher Education International Conference (pp. 1248-1255). Austin, TX, United States: Association for the Advancement of Computing in Education (AACE). Rohde, M. (2013). The sketchnote handbook: the illustrated guide to visual note taking. Peachpit Press. Shambaugh, R. N. (1994). Personalized Meanings: The Cognitive Potentials of Visual Notetaking.